We know that everybody's budget is different. Whatever you have to spend we are confident that we can deliver you a beautiful bespoke kitchen. Call us today to discuss your options. We are committed to ensuring that you get the kitchen you deserve at a price that makes you smile. We also specialise in kitchen makeovers. 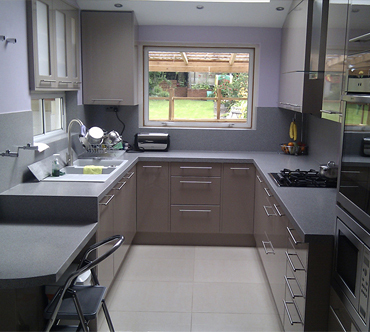 We can replace your doors and worktops and give your kitchen a completely different look for a fraction of the cost. All our doors are manufactured specifically for each job so we are able to make them to the exact sizes required. All of our bespoke kitchens are personally designed by a member of our team to meet your needs. The carcasses will be built to the exact measurements of your kitchen to make sure we utilise the space to maximum effect. You will be able to chose the colours and finish of the doors so that your kitchen truly reflects your personality, be it classy black gloss, a traditional wood finish or contemporary ivory. Whatever you desire we are sure we can meet your needs. We always work with our suppliers to obtain the best possible products. We are confident that you will appreciate the quality of the products as much as we do. We would love to show you what we can offer and welcome you to visit our new showroom to see what we do.